When my friend Brittany told me she would be making these cookies, I was immediately intrigued. These cookies combine the flavor of chocolate and coffee - one of my favorite flavor combinations in baked goods! I really liked these cookies because they were light, airy and the coffee filling in each was delicious. If you're looking to make a special cookie that's sure to impress, this is the cookie to make! 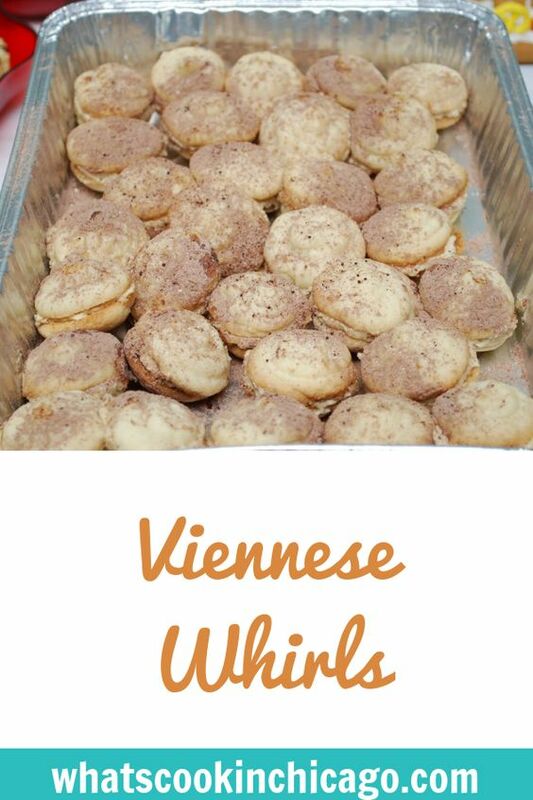 Cook’s Tip: For mocha Viennese Whirls, substitute 1 oz / ¼ cup cocoa powder (unsweetened) for 1 oz / ¼ cup of the flour. Preheat the oven to 350 degrees F / Gas 4. Grease two baking sheets. Cream together the butter, confectioner’s sugar and vanilla extract until light. Stir in the flour and cornstarch and mix until smooth. Using two tablespoons, spoon the mixture into a pastry bag fitted with a ½ inch fluted nozzle. Pipe small rosettes, spaced far apart, on the prepared baking sheets. Bake for 12-15 minutes, until golden. Using a metal spatula, transfer to a wire rack to cool. To make the filling, put the ground coffee in a heatproof bowl. Heat the cream in a small pan to just below boiling point and then pour it over the coffee. Leave to steep for 4 minutes, then strain through a fine sieve into a clean bowl. Beat together the butter, confectioner’s sugar and coffee-flavored cream until light and thoroughly combined. Use to sandwich the cooled cookies together in pairs. Dust the whirls lightly with confectioner’s sugar and cocoa powder. These Viennese Whirls look fab! Merry Christmas and happy holidays!